As has been oft mentioned throughout this Revelationnum, the Photos have all been enhanced using a variety of different techniques in a variety of different Photo enhancement programs in order to bring out the features needed as examples for the explanations. 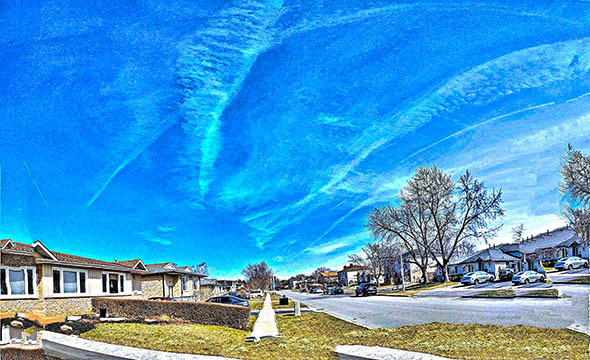 Some photos started out much worse than others, particularly those from 2014 in Brantford and Paris which were taken by a cell phone set to Video by mistake, and came out dirty brown. As eventually came to be seen, enhancements saved the day. 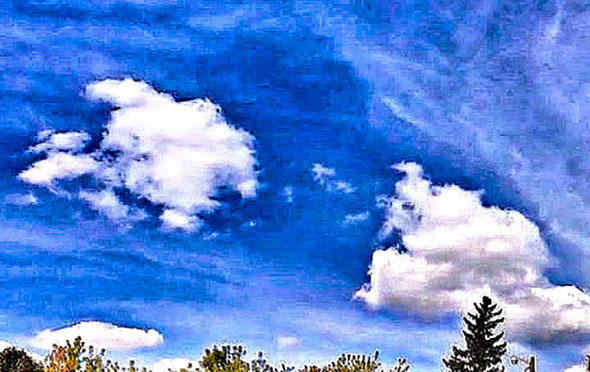 The original version of the early Brantford photo taken in September of 2014, and shown enhanced as Figure 9 in Starrgram 2 is a good example. As you can see below, not much to look at except a few trees, buildings, and clouds. The trees and buildings are the dominant feature. However, after the enhancements it is a whole different, heh, picture. Now the clouds dominate, and in particular the background cloud is now clearly Radionic. More importantly, the enhancements allow you to begin seeing the good stuff completely lost in the originals. For example, you now clearly see a Negative pole Mobile Scout Ship Condensate sitting at the center right just above the roof peak. Straight up from it is a lighter Positive pole partner. Check back to the original above and see what you see. Even better, the enhancements allow for blow ups, showing off even more stuff not seen in the originals and not readily seen in the enhancements. For example, the Figure below is a blow up of the Cumulus clouds at the center left in the Figure above. 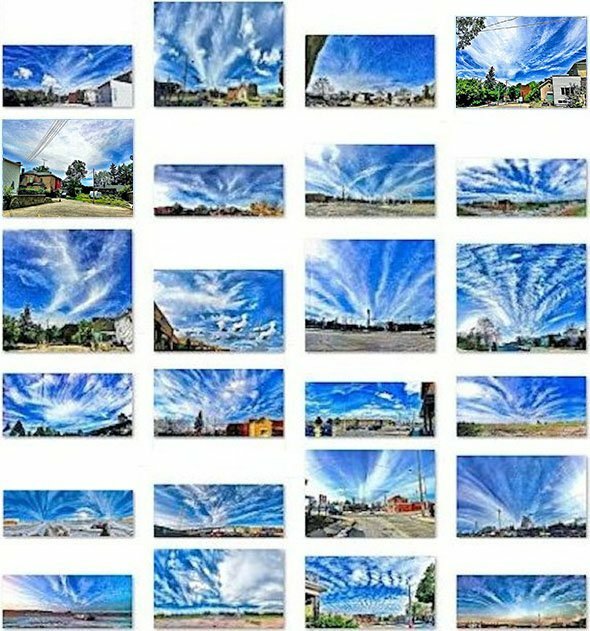 Now you can see that the clouds are filled with Mobile Scout Ship condensates of many types and varieties not easily seen in the Figure above and barely at all in Figure 1 above. Check back and look again. This is the basis upon which Volume ll of this Revelationum will be presented. This current Volume l presents the Radionic Fields, Volume ll will present what's in them. This is also the trick for spotting Mobile Scout Ships. which you almost never see in the sky under normal circumstances. Namely, enhance any photo best you can, blow it up, then look around. Figure 3 - Ah hahhh!. For fun, a number of original and enhanced Photographs are presented below for comparison. While they are not particularly informative on the Radionics side, they do provide a window into what improvements are possible for photos you might have that are not exactly up to snuff. The first pair of Figures below is all of photographs taken by known hands on the camera as side by side sweeps and PhotoMerged into single panoramas. The next pair below are all of ones found on the Internet, where some have likely been taken as an original panoramic photo by the original photographer, or done by a PhotoMerge program, or are just as a single shot. 2. INTERNET PHOTOGRAPHS - All by not known hands on the camera. 4. Movavi - 'Photo Editor'.